February 20th, 2015 March 2nd, 2015 UnaXComments are off for this post. As mentioned in my post from Wednesday, I’ve been working on setting up my Raspberry Pi as a small energy-efficient home server. I’ve been working freely from the brilliant guide written by Mel Grubb found on his website, doing it in the steps that I wanted on my server. That is how far I am at the moment and the order that I’ve been doing it, but I’ve run into some problems with setting up the Samba share correctly. As I haven’t added a hard disk to the Pi as of yet, I just made some folders to share in my home folder at unax/home/Data. Then I followed the guide to do the Samba setup through the Webmin interface, allowing guest access and for everybody to be able to write to said folders. I have no problems in finding the wonderfully named UnaXPi on the server or in seeing the shared folders. However, when I try to add files from my Windows 8.1 machine, I get rejected due to not having the correct permissions. I’m not an expert on Samba in any way, but I’m starting to think that the issues stem from me trying to copy to the home folder of my Raspbian user unax, instead of a folder not placed within the realms of a user. I’m trying to troubleshoot a bit more and I might try by adding a USB pen drive and see if I can get it to work on the /mnt/ folder instead. Apart from that, I also did some customization of the Webmin interface to make it look more interesting, by installing the Authentic Theme and it looks wonderful. The installation however was a bit confusing to me, as I tried installing it as a module instead of a theme and I feel the Webmin error message of the ‘File Not Found’ ilk, wasn’t very helpful. Finding the ‘Theme’ option in the configuration however, helped me a long way. This meant that it worked, but I’m not really sure that I needed both the perl-libwww and perl packages, so there might be some redundancy present on the server now. If I look away from the snags I got with the Samba share, I’m very happy with what I’ve achieved so far. 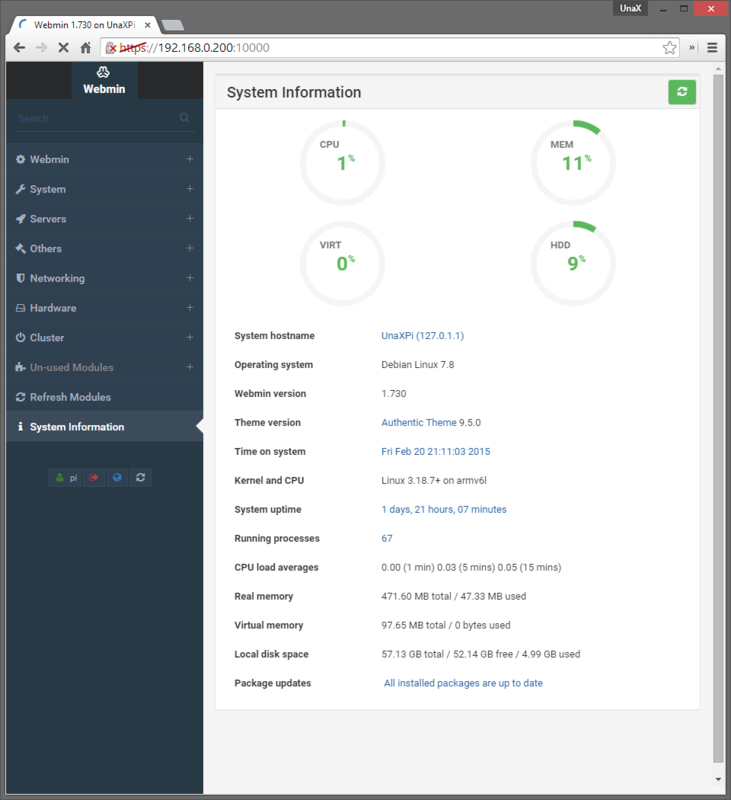 I can connect to the UnaXPi through Webmin from my entire network, see the shares on the network, connect via OpenVPN and the Raspbian OS and Raspberry Pi firmware is updated. Now to try and get write access to the shares and try some DNLA media sharing.